After almost 8 years of fulltiming I have suffered from most problems that commonly ocurr to fulltimers. What follows is a list of tools and spares that I just wouldn’t fulltime without now. This is not a comprehensive list of all tools you might want to carry and you can always add to this list. These are just what I consider essentials. You may not know how to use some of these items, but they are still worth carrying. For example the Multimeter. If you have an electrical problem and need it fixing quickly. You can reach out on the internet for advice. The first question you might be asked is do you have a multimeter. If you say no, then your helper may stop there. However if you have one, they will explain what you need to do and how. It might just get you out of a pickle. The other reason is, you may be on a campsite and you or someone else may have a problem, there is an electrical guy there but he doesn’t have his tools with him. You just might help yourself or someone else out by carrying one. I have had this experience multiple times over the last 8 years. In this series of Articles I will be covering my top 20 tools and spares that I would recommend all fulltimers carry. This might be the most boring one, however if you don’t have this stuff you may well regret it and it might even save you from injury or even death. I always carry 3 kinds of gloves in my van. The first is Rigger safety gloves. These are handy for winding in your hookup power cable as you can use them to wipe down any water/mud from the cable as you wrap it up. They are also handy for dealing with your rubbish and other non liquid hazards. Make sure you get the thermal ones as dealing with anything in the winter can make you clumsy and more likely to suffer a physical injury. I keep mine on the Dashboard of the van. 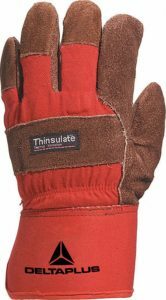 It is also worth making sure that you get ones that are fully protective as some of the cheaper rigger gloves are nothing more than gardening gloves which are designed to protect digits and knuckles. The rest of the glove is made up of soft material that doesn’t protect you from either injury nor cold. These are the ones I have and have found them to be life savers. For instance a couple of years ago I got my van stuck during the winter but was offered a tow. Using these gloves protected me from the cold and physical/mechanical injury whilst handling the tow rope and wedging wood under the wheels. The second type of gloves you should carry is the waterproof rubber gloves. A bit like industrial Marigolds. I keep these in my van next to the toilet cassette. I not only use them when emptying my waste, but they come in handy for scrubbing out the cassette during the maintenance cycle. I can also guarantee that at some point you will drop something valuable somewhere nasty. If you are carrying these gloves then more often than not you stand a chance of recovering said item without putting your bare flesh into the nasties. These are the ones I have. Make sure you get the heavy duty ones or they won’t last, or you might end up getting a rip at the most inconvenient time. 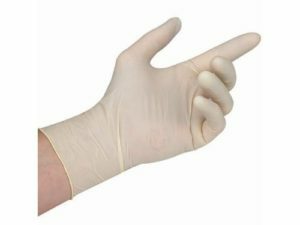 The last type of glove I carry is the disposable medical grade latex gloves. 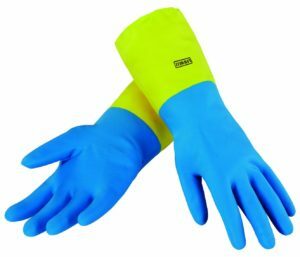 These come in handy for not only medical emergencies but for messy jobs such as lubrications, painting, cleaning plus much more. At less than £5 for a box of 100 they are well worth having. Here are the ones I use although you may need a different size. If you have an allergy to Latex do a search for Nitrile or Vinyl Gloves. I don’t find them as comfortable so would always go latex first if you can. 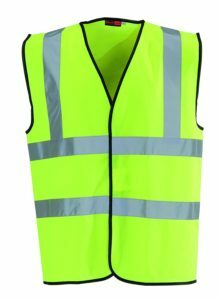 Well that is all for the exciting subject of gloves… The only other essential safety item is the high viz waistcoat. Whether it is for use when you break down, or walking back from the pub on a dark night being seen is extremely important. I like these lightweight jackets because they fold up and can fit into your coat pocket or handbag when not in use. You don’t need to walk into the pub in it and can put it on after you leave if you are image conscious. I keep mine on the back of the passenger seat so it is to hand when ever I need it. Well that is it for the Safety gear. There is a lot more safety equipment you should consider, but for me these are the bare essentials. Please come back soon and see what is at number 19. ← Quick Tips – Fulltimers Maintenance before Winter.